Some people have heard the line, "rain follows the plow." It's become a poetic way to say that the world will provide, given a person puts in the work. Once upon a time, it was actual climate science. It did not prove correct. During the late 1800s and early 1900s, a burgeoning population and a steady flow of immigrants into America pushed people out of cities and established farming territories. For much of United States history, the people who reached the Great Plains kept going right on through. Certainly there were people who set up farms there, but they clustered around creeks and rivers. The dry, treeless land didn't hold much promise for people accustomed to wetter country and the water-loving plants that grew there. People were taking a second look. With few inviting territories left, they were forced into the more arid parts of the plains. Surprisingly, this turned out well. Climatology was in its infancy. The United States Geological Survey had just started taking measurements of the rainfall in the less-populated areas. Although people knew that the plains were light on moisture, they noticed a strange thing when people started farming in dry areas. Rainfall got heavier, the earth was wetter, and crops flourished. Without much in the way of experience, and without the data necessary even to more experienced climatologists, they began to think that agriculture so changed the environment that rains became heavier the moment enough of a patch of ground was farmed. This was not a fringe theory. Sure, the phrase "rain follows the plow," was coined by a land speculator, but actual agronomists agreed. They also agreed that the earth would "save" some water for dry years, so that as rainfall decreased, there was no cause for alarm. Unfortunately, agronomist and land speculator opinion doesn't change the weather. It just changes the amount of people who are willing to bet that unseasonable rains are going to last. 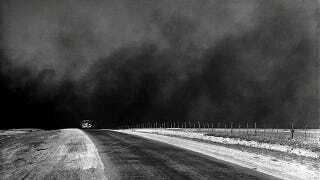 Rain was succeeded by drought, and homesteaders lost their crops and, eventually their homes. The idea that we can change the weather with wishful thinking, however, remains.